A session, simply defined, is similar to a period in a classroom. 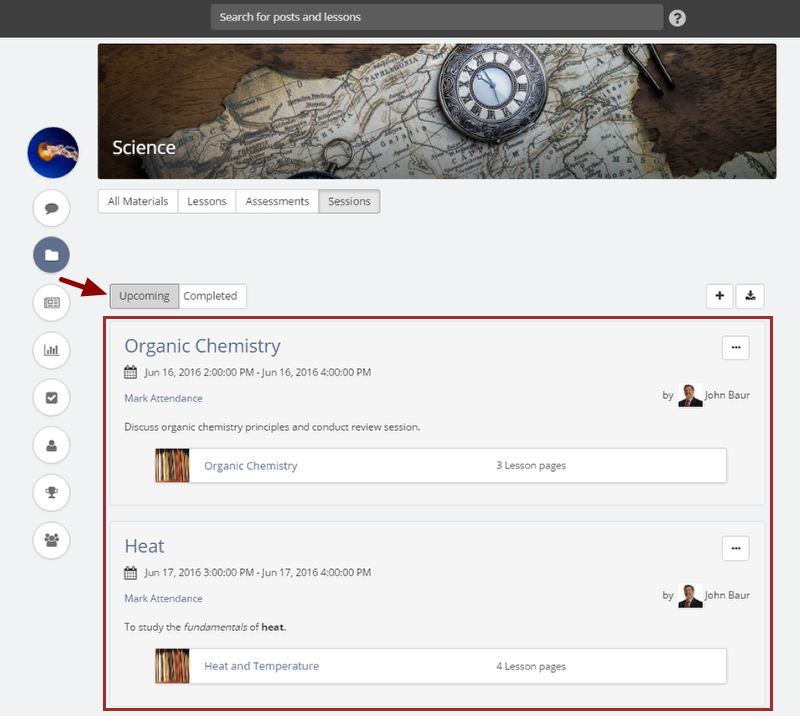 Instructors can create new sessions and link existing materials (only published materials) to them in their classrooms. A session can be conducted by multiple instructors. After the session is created, you can mark attendance of learners as Attended, Late or Not Attended. By default, learner’s attendance is marked as Attended. 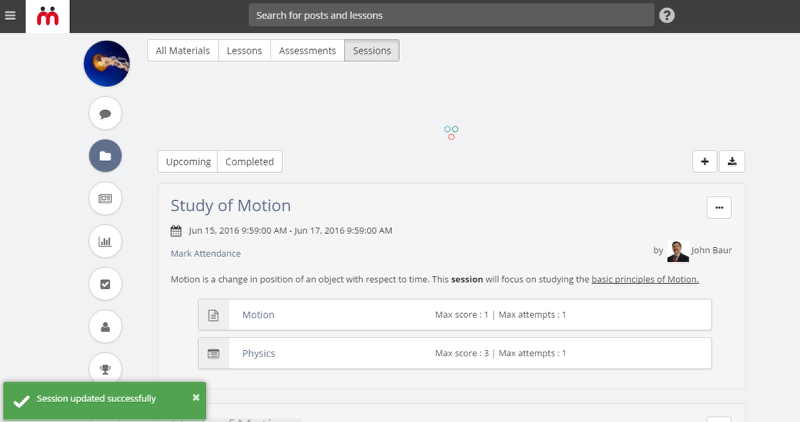 As an instructor, you can track the total time spent by each learner in your classroom. •	Collaborative learning and so on. 1. 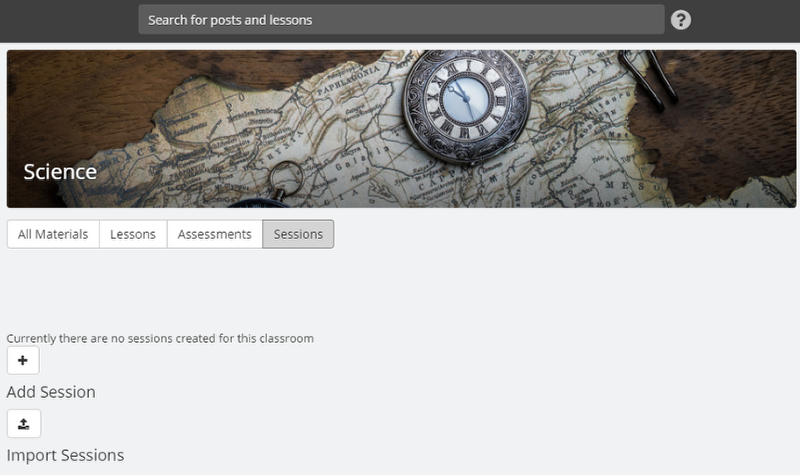 Click Materials of the classroom in which you want to create a session. 2. Click Sessions tab. 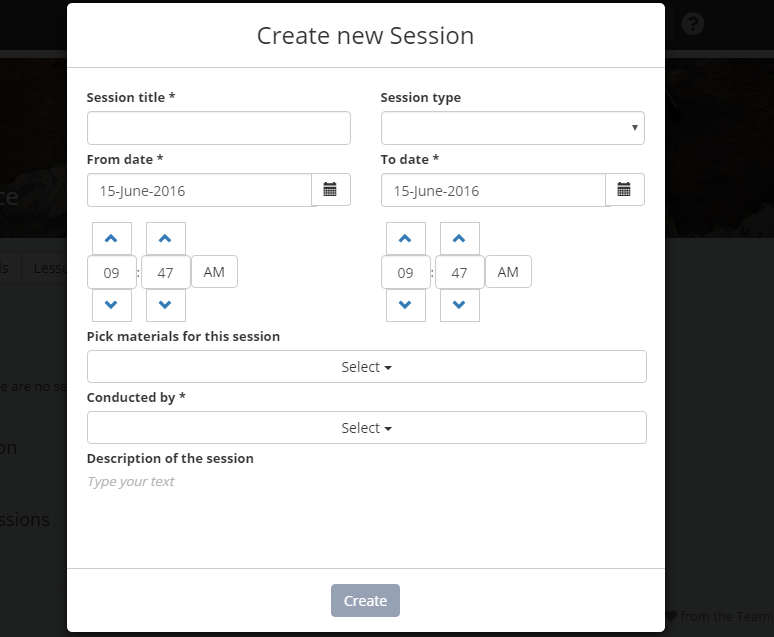 You will be taken to the Sessions page where you can create new sessions or access the previously created sessions, if any. 2. 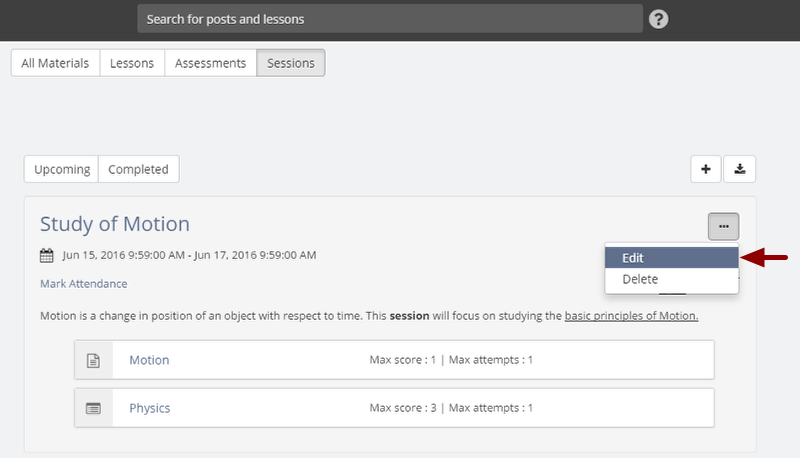 In case there are no sessions created for this classroom, you will see a + (Add session) button. Click on it. Note: You can also bulk import sessions. 3. 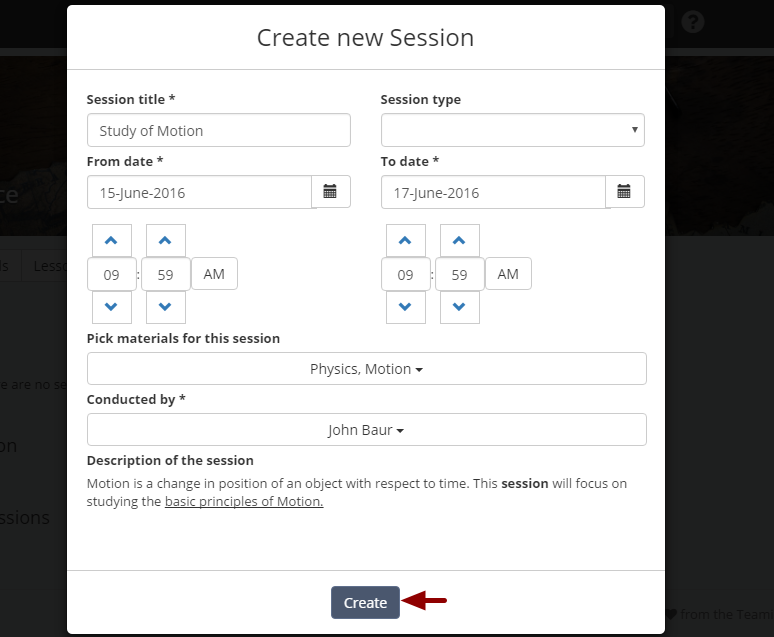 In case there are already some sessions created in the classroom, then click '+' to create a new session. 4. The Create new session pop-up appears. 5. Enter the Session title. 6. You can select the session type value from the Session type list. Note: Initially the drop-down list for Session type list will be empty. The list value for the Session type will be created by your administrator. For example, a flipped classroom, lab etc. 7. Select the From date & time. It's the date & time when the session starts. From date can be selected from a past date too. Note: If the From date and To date are the same and you change the time of the From date, the To date time will get updated automatically. This will help you create a session quickly. 8. Select the To date & time. It's the date & time when the session ends. It can be set same as the From date or any other future date. Note: Two sessions in the same classroom can have overlapping timings. 9. 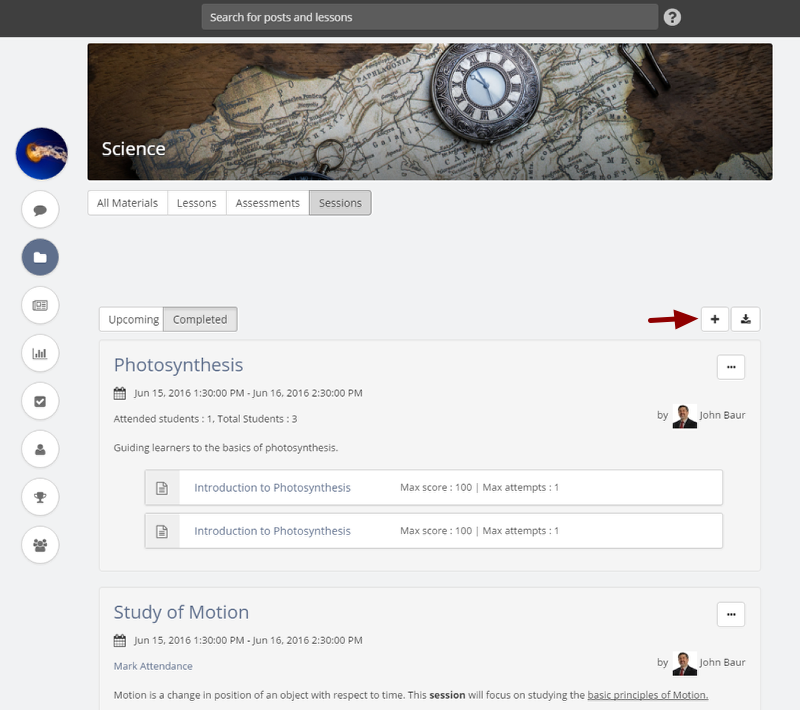 In case you wish to cover any lessons or assessments in the session, you can select it from the Pick materials for this session drop-down list. You can use the search box to search for any lessons or assessments, or simply click Check All to select all the materials from the list. Note:The lessons and assessments must be published and must belong to the same classroom for which the session is being created. 10. Select the person who will be conducting the session from the Conducted by drop-down list. 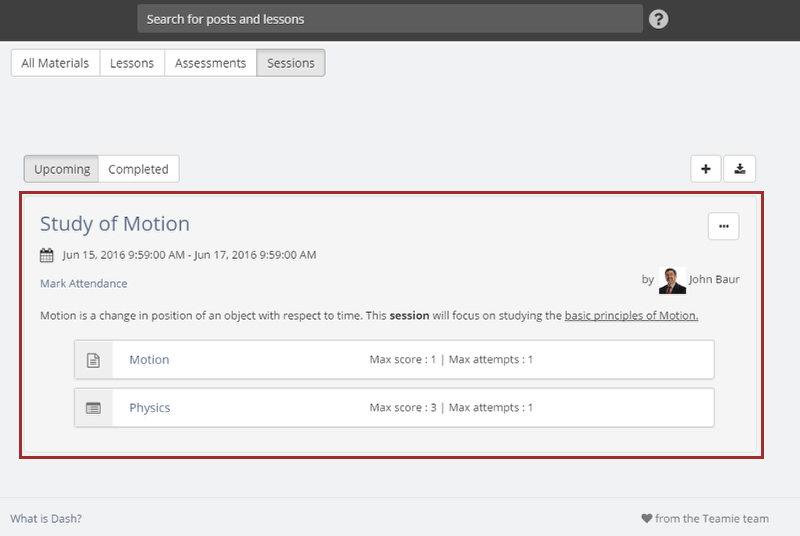 You can select any user with the 'Instructor' role in the classroom to conduct a session. 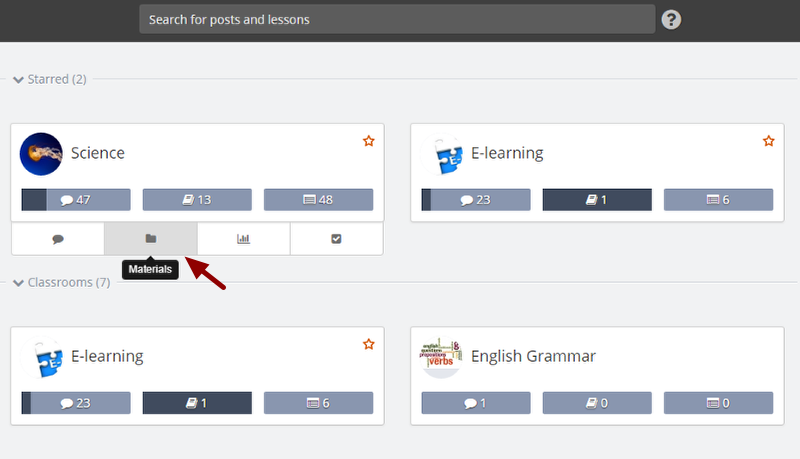 You can use the search box to search for any user, or simply click Check All to select all the users from the list. 11. Enter the Description of the session to describe the overall gist of the session. The description text supports the rich text formatting, so you can make the description of your session more emphatic by formatting certain keywords. 12. Click Create to create the session. 13. A success message appears confirming that "Session created successfully". 14. 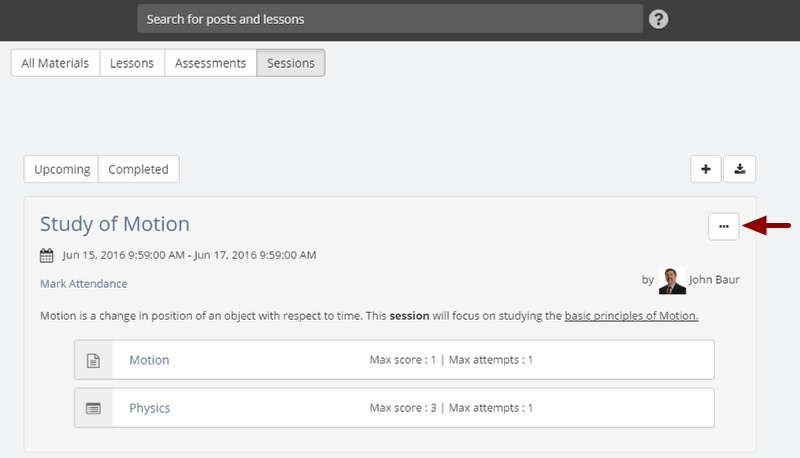 You will be able to see the newly created session on the session page. 15. After the session has been created, a corresponding calendar event will be created for that session in that particular classroom's calendar. The title of calendar event will be the same as the session's title and the session description will become the description of the calendar event. 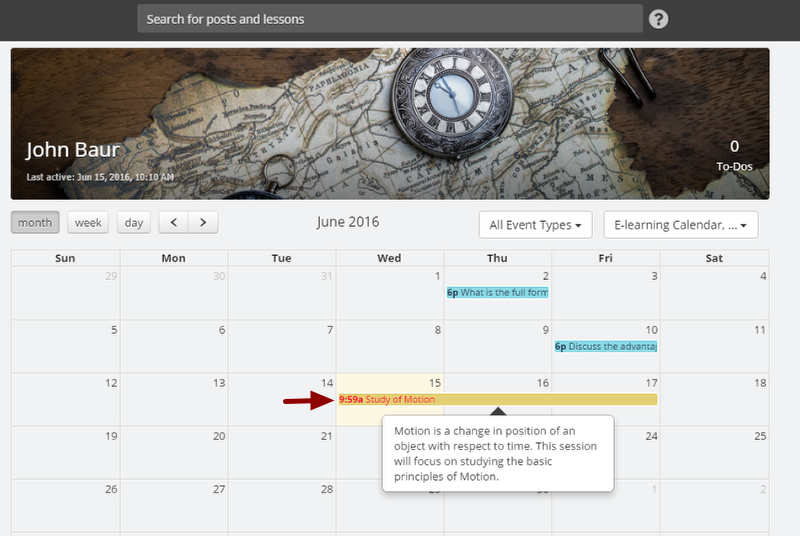 Note: In your calendar view, you will be able to see all of your upcoming and past sessions for your classrooms. 16. You can filter the Sessions on the calendar page by using the All Event Types filter. You can edit previously created sessions any time. Let's see how you can do it. 2. Click on the ellipsis (...) of the required session. 3. Select Edit from the drop-down list. 4. 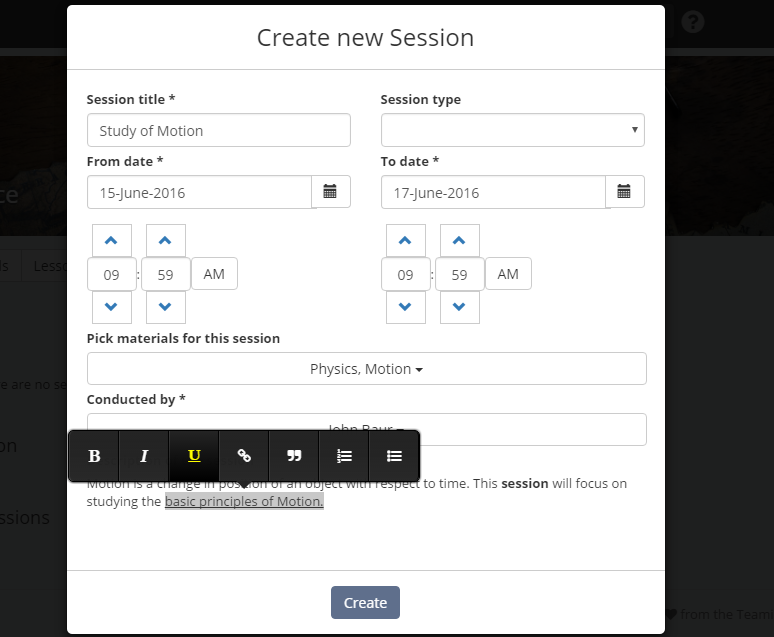 The session creation page will open. Make the changes as per your wish. Any value can be changed on this page. Note: From & To dates of a session can also be changed and can be set in the past too. 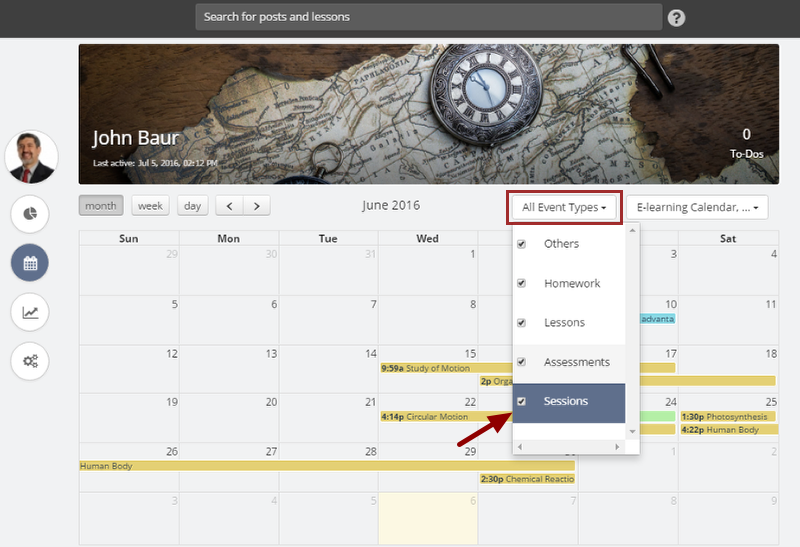 Once the From & To dates are updated, the calendar event for the session also gets updated for all users in the classroom. 5. Click Update to update the session with new details. 6. A success message appears confirming that "Session updated successfully". When you delete a session, the calendar event for the session gets removed from the classroom calendar and the attendance information for that session is deleted too. 1. 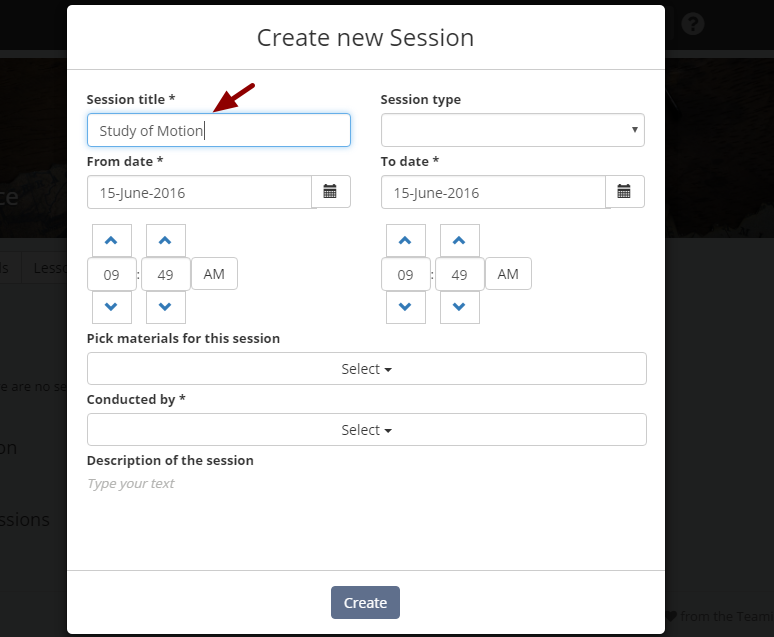 Access the sessions page and click on the ellipsis (...) of the required session. 2. Select Delete from the drop-down list. 3. 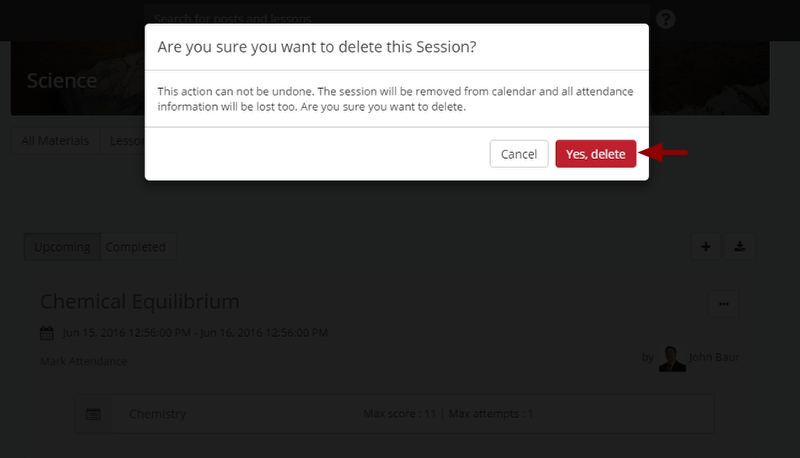 A confirmation popup appears asking for confirmation to delete the session. Click Yes, delete if you are certain about deleting the session. Note 1: The session will be permanently removed and cannot be recovered later. Note 2: The session entry will be removed from the calendar and all the attendance information will also be permanently removed. 4. A success message appears confirming that "Session deleted successfully". Sessions are divided into two types: "Upcoming sessions" and "Completed sessions". 3. 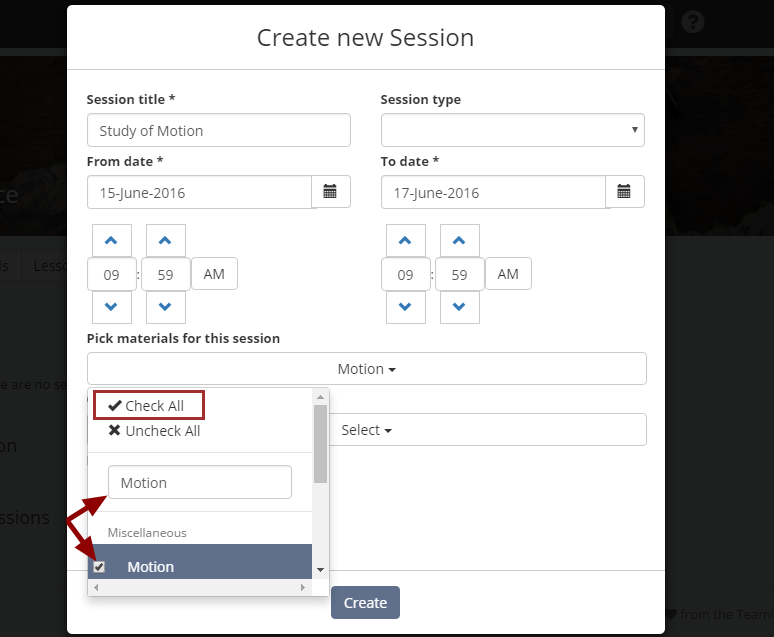 By default the Upcoming toggle will be selected and all the upcoming sessions will be shown on the sessions page. You can mark attendance of the learners in any session from the Mark Attendance link of that session. You can mark whether the learners attended/ not attended the session, or were late for the session. 1. 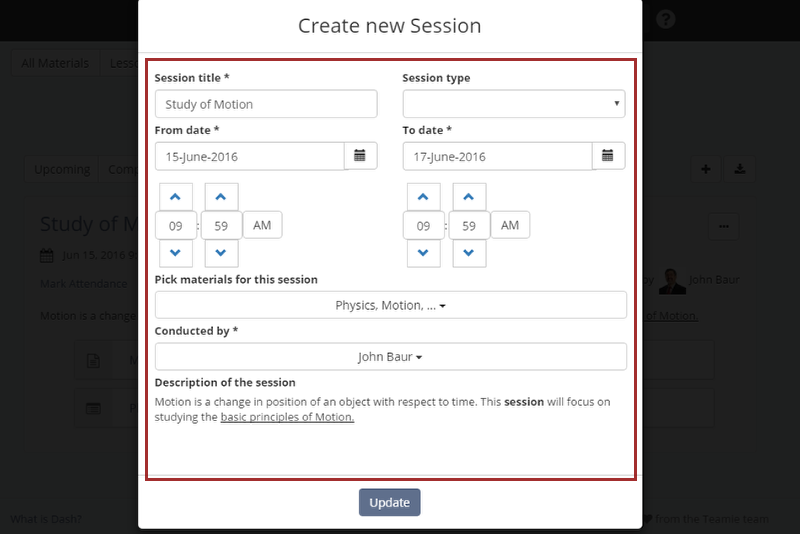 Access the session page and click Mark Attendance of the required session. 2. Click on the session in which you want to mark attendance of the learners. 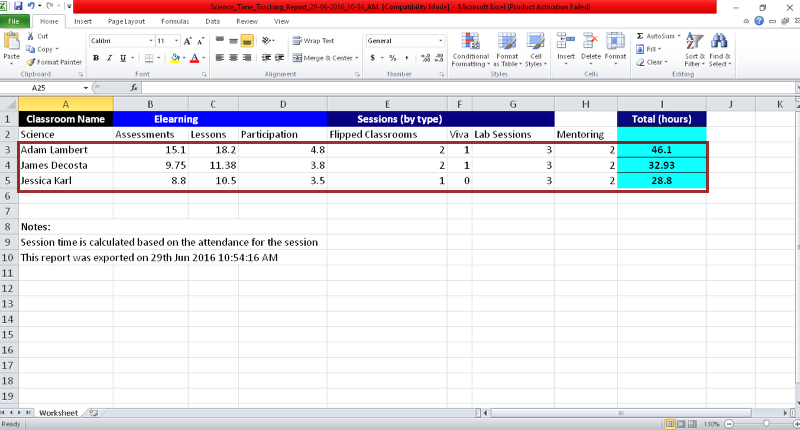 You can view the sessions in which the attendance is yet to be marked under the Marked column. 3. Tick the learner status for the session, i.e, whether he attended the session, not attended the session, or was late for the session. 4. In case you are marking a learner Late. you can even change the duration for which he attended the session. Note: By default the duration for Attended learners will be set equal to the total length of the session (in minutes). 5. After marking attendance click Save. Attendance will be marked. 6. Click Back to go to the sessions page. 7. 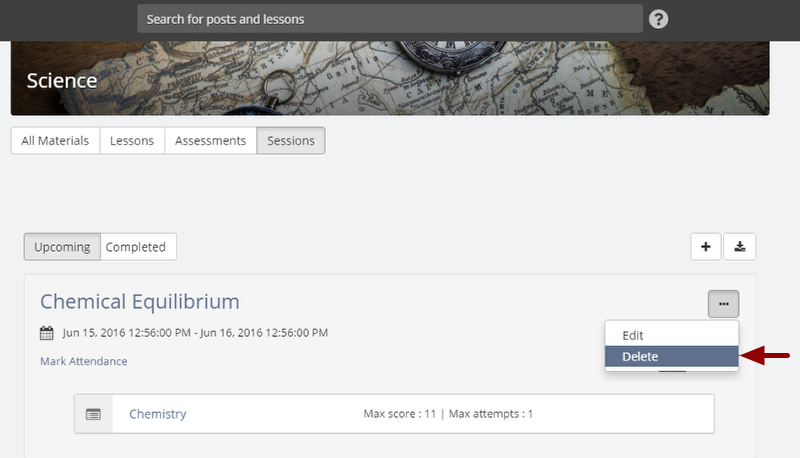 On the sessions page, you will be able to see the number of learners who have attended the session along with the total number of learners in that sessions. Time tracking report is basically a report which gives you the information about the time spent by every learner in your classroom, based on his/her attendance history as well as the time spent by him/her on Teamie. 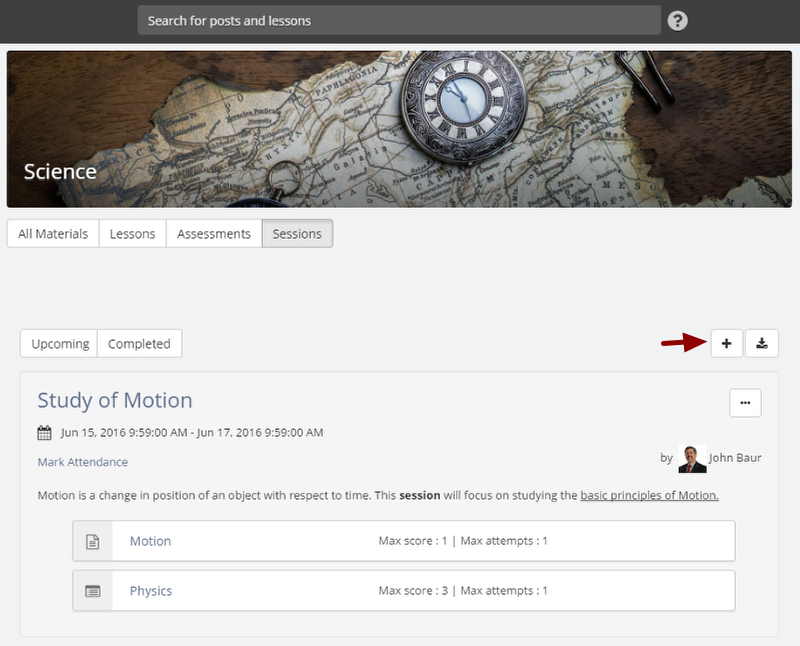 The Time Spent for Lessons, Assessments and Participation is calculated by tracking the amount of time spent in the Lessons, Assessments and Newsfeed pages of the classroom. The time spent in sessions is displayed by session type. If a learner was present for a one hour session, then he/she is considered to have spent one hour's time for sessions. If he/she was absent for a session, then he/she is considered to have not spent any time for that session. If attendance was not marked for him/her for a particular session, in that case also he/she is considered to have not spent any time for that session. 1. Click Materials of the classroom whose time tracking report you wish to export. 3. Click Export Time Tracking Report for Classroom icon. 4. The export process will be initiated. Wait till the export process is completed. 5. 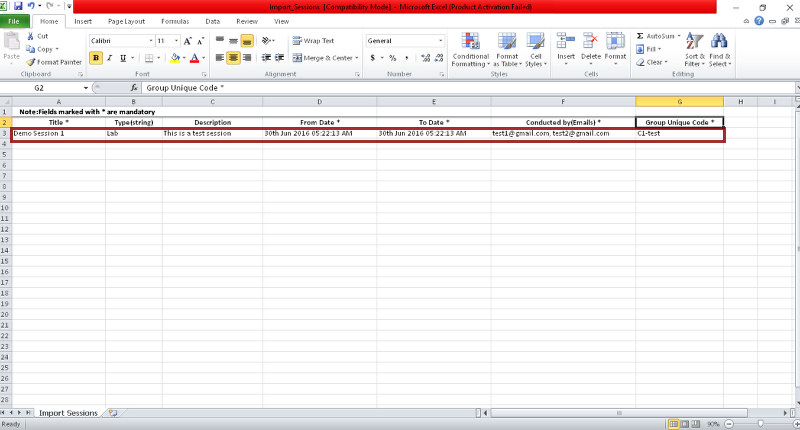 After the export process is completed, an excel sheet containing the time tracking report will be downloaded. Click on it after it is downloaded completely. 6. 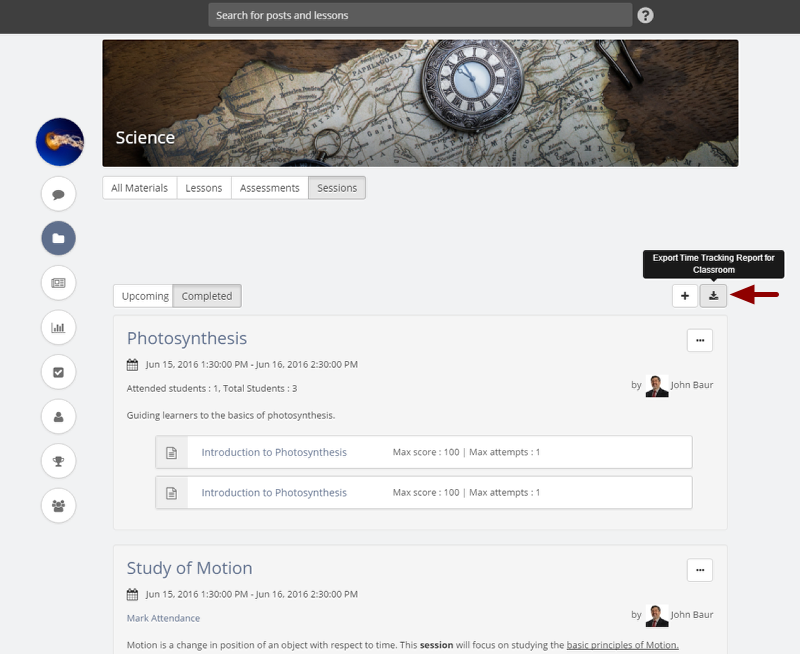 You will be able to view the time tracking data of all the learners. 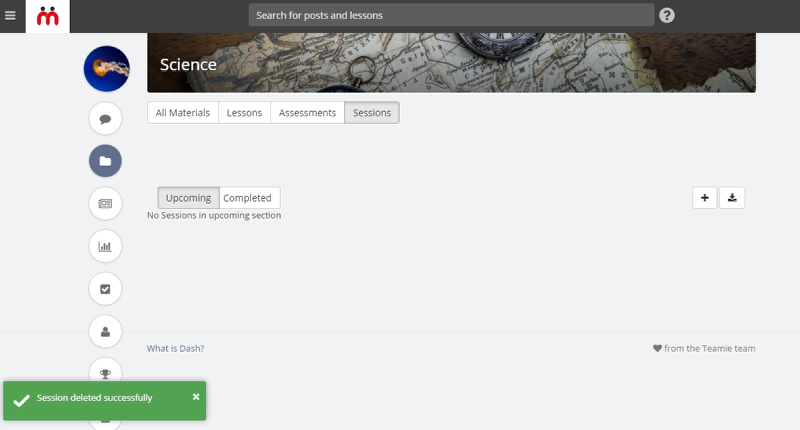 In case you need to create sessions in bulk in any classroom, you can easily do that with the 'Import Sessions' feature. All you need to do is download the Excel template, fill out the required sessions detail and upload it to create sessions in bulk in any classroom. Let's see step by step how you can achieve this. 1. Access the sessions page and click +. 2. Select Import Sessions from the drop-down list. 3. On the Import sessions page, click Download Sessions template to download the template required for importing sessions in bulk. 4. Open the Excel template. 5. A sample row will be filled for your reference. 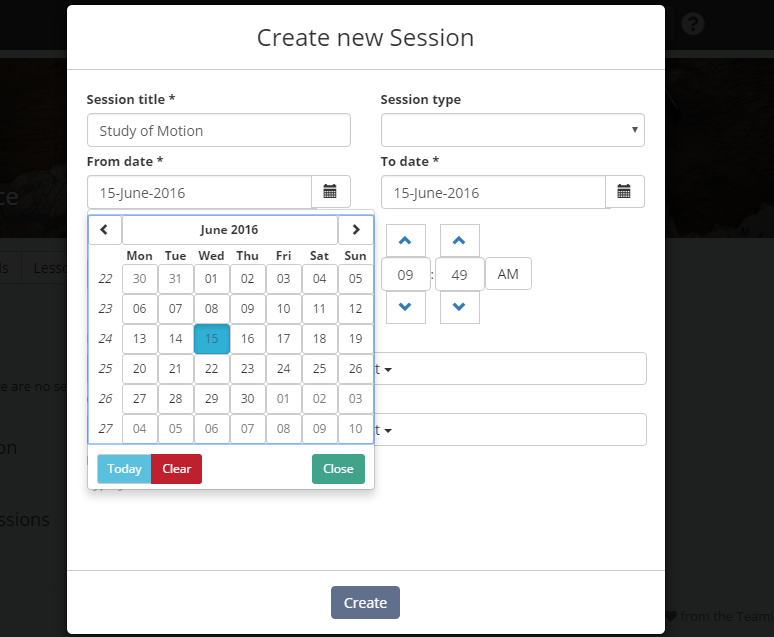 Fill your sessions details from the next row. Note: Don't fill out the details by editing the reference row. Note: As an instructor, you won’t be able to create a new session type from front end, but you can enter a new session type value in the template and initiate the bulk import process. 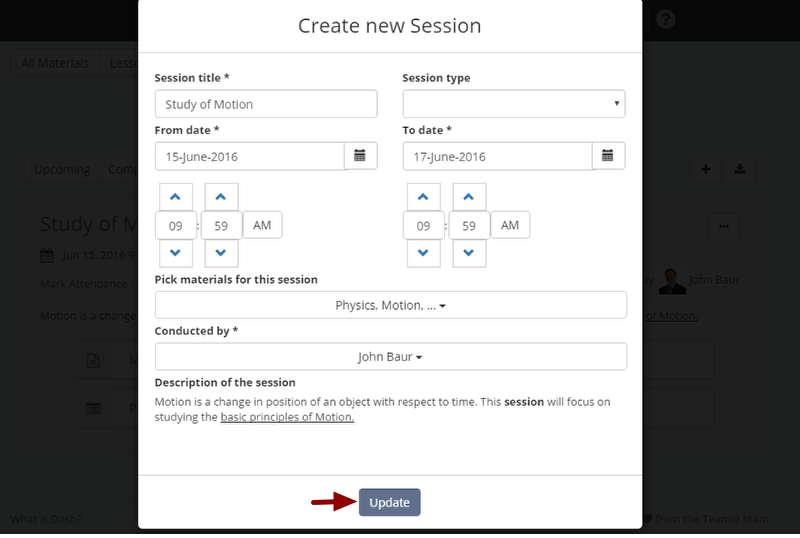 Then system will create the newly entered session type value for you. Description: Enter the description for the session. This will convey the basic idea of this session to your learners. 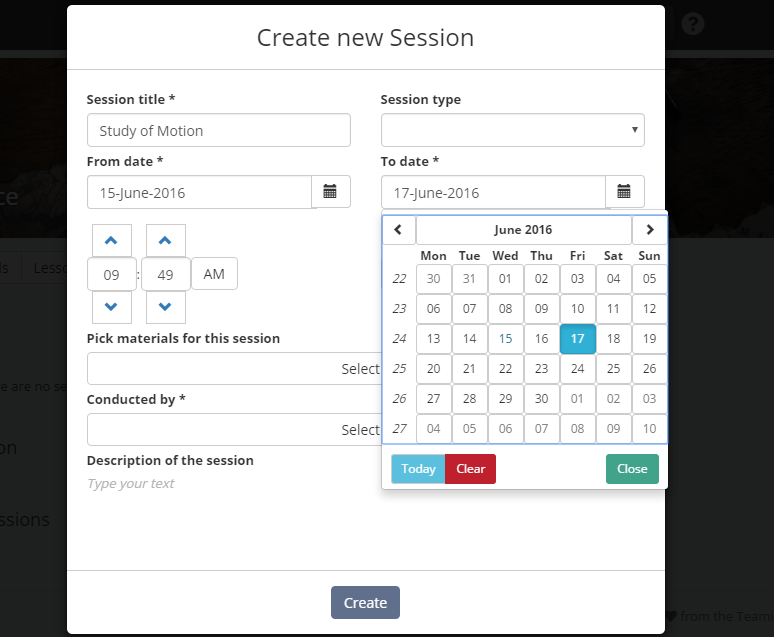 From Date: Enter the session From date & time. It's the date & time when the session starts. From date can be selected from a past date too. To Date: Enter the To date & time. It's the date & time when the session ends. It can be set same as the From date or any other future date. Note 1: Two sessions in the same classroom can have overlapping timings. Conducted by: Enter the valid email id of the instructor who will be conducting the session. 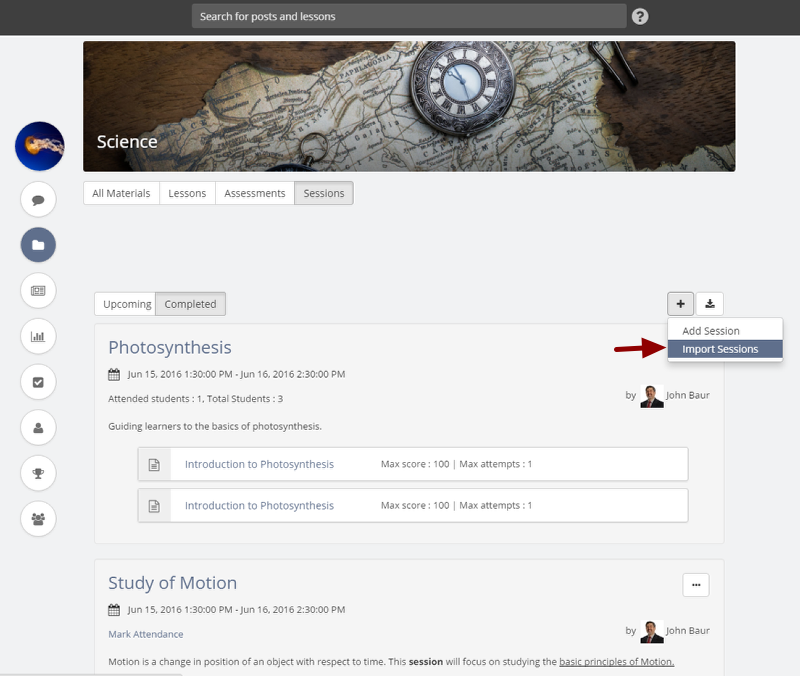 You can enter valid email id of any user with the 'Instructor' role in the classroom to conduct a session. You can enter multiple email ids by separating them with commas. Group Unique Code: Enter the group unique code of the classroom in which you want to create the session. 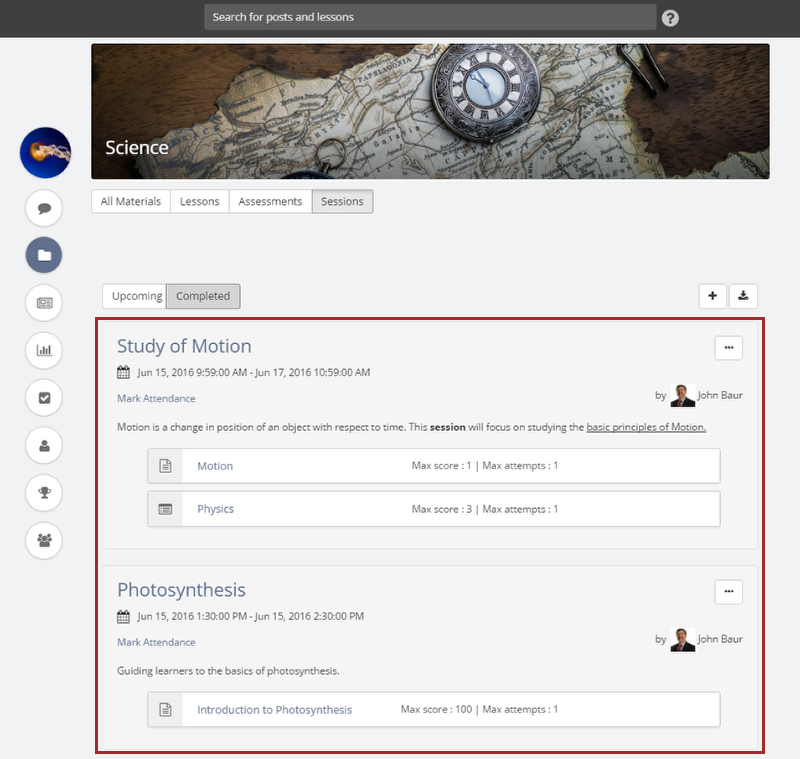 You can view any classroom's group unique code from its About page. 7. Save the excel sheet on your computer. 8. On the Import sessions page, click Choose File and select the template excel sheet from your computer. 9. Click Import Sessions. In case you wish to delete the uploaded excel file, click Remove. 10. The import process will begin and you will be able to see the progress bar. 11. After the process is completed and the progress bar reaches 100%, you will see a success message stating the number of sessions imported successfully out of the total sessions you tried to upload. 12. In case, some field information is incorrectly entered for any session in the excel template, you will be notified about it along with the error details. 13. 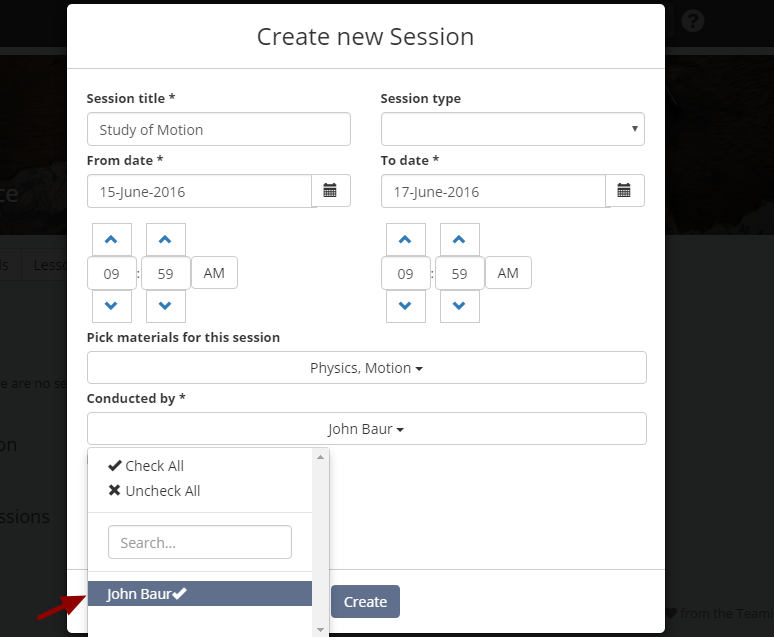 You will be able to view the successfully imported sessions on the sessions page. You can edit or delete them as per your liking.